I'm having a quick little sale over on Ravelry for all my patterns. 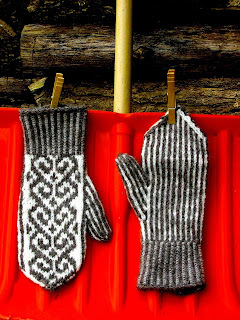 Also, did you know that you can buy my patterns online at Loveknitting.com? I've got patterns for sale online there as well, and they include alternate yarn suggestions in case you want to buy yarn and the pattern all at once. Note: The Ravelry sale is not applicable at Loveknitting, but you can still get my Plum Ribbed Cardigan on sale there at a discount. So, I think the whole #slowfashionoctober movement has passed me by, because I'm not on instagram. I'm a bit retro: when we moved to Canada, we didn't get cell phones here, and I eventually gave up on the US one I had. I haven't kept up with the smartphone, texting, selfie stuff that I see people doing all around me. In fact, I found it to be a relief. We don't get a lot of phone calls and to be honest, I don't miss it, mostly. Life with twins and two dogs is noisy. I don't think I always have to be available--and juggling the folks in my household takes all of my attention a lot of the time. Truthfully, the only time I really thought I should have a phone was back in the spring time, when I had my little surprise trip to the ER and was too sick to use one myself anyhow. Although I have dropped in on the instagram conversation as a lurker, I realized I wasn't debating things in the way others have. I haven't been wondering how I could make all my own t-shirts, or spelling out the origins of every piece of fabric or yarn in my stash. I haven't sworn off anything much, either. On the other hand, I don't buy a lot new in the first place. Then, I had (gasp) an underwire pop out of one of those essential female undergarments. I was down to way too few of those anyway, and had to go to The Bay and check out their lingerie sale. Now, I think I bought all of "last year's models" and saved a lot of money. Were all those bras and pairs of underwear made in a place with good working conditions? With a decent minimum wage? I just don't know...but Rome wasn't built in a day. I have to take a middle path about this. There's no way I'll have time to figure out how to make underwear this month. It's just not in the schedule. This month, as usual, I've fixed lots of things. I mended and patched many pairs of little boy pants. I knit up an extension on this sweater. 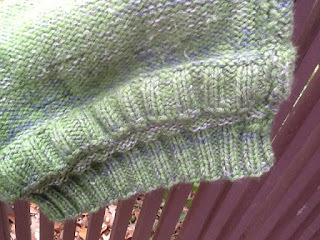 Instead of cutting off the old ribbing, I left it in place, picked up stitches right above it, and knit down. Luckily, I had matching yarn left over, although I have a feeling the kid in question would have been fine with contrasting yarn, if that were on offer! 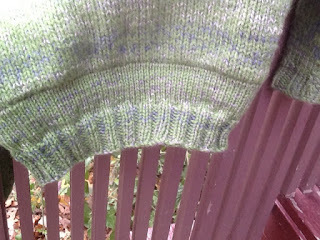 I debated cutting off the ribbing at the end, but felt it was risky. This kid is narrow in the hips, so instead, I just basted down the ribbing on the inside, and it forms a double layer band towards the bottom of the sweater. It looks tidy enough on the inside. Now, in this action shot, over a hand me down polar fleece, if you undo the sleeve cuffs, you can see there is still room to grow this season, and the sweater has already been in action again...worn out and about. 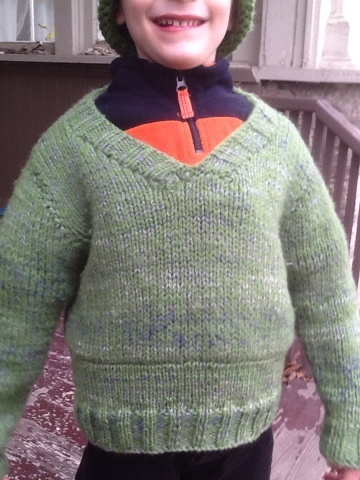 The kid in question is pleased as punch to have his sweater back. I haven't done as much writing about Slow Fashion this month as I had intended. However, maybe I have some excuses to fall back on. Pre-twins, I did write a whole book about this back in 2009. 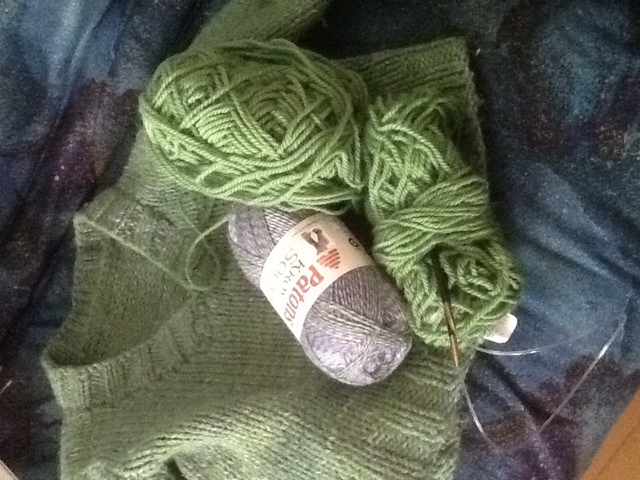 You know, about making ethical and green choices when it came to choosing knitting yarns and textiles in general...Knit Green. I also realize that while I may not be snapping so many perfectly staged photos, I am indeed spending those moments trying to mend, recycle, reuse, and maximize what we've got at home when it comes to clothing. Yesterday, I showed someone the knitting in my purse. It's the sleeve to one twin's fall sweater (each kid gets one handknit sweater a year, if I can manage it) and one half of a handknit kid's sock. It's all from my stash--no new yarn purchases. I'm still trying, one stitch at a time, to make things from scratch in a responsible way. Here's my latest piece on the CBC, which ran while we were travelling. It is (surprise!) about priorities...educational ones. How do we decide which students get priority? Why do some misdeeds related to stealing intellectual property get seriously penalized while others are ignored? Also a matter of priorities...how do you know when to salvage something, how to mend it, and when to give up? 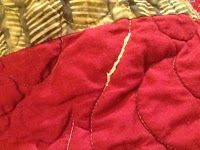 This is a mending job I did recently on a beloved quilt. It belongs to one of my twins, it was handmade for him and has his name quilted right into it! 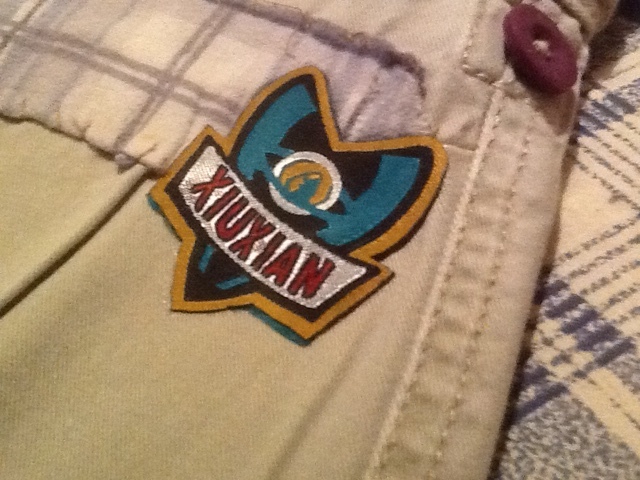 However, some of the stitching came out. So, I made a very obvious repair. 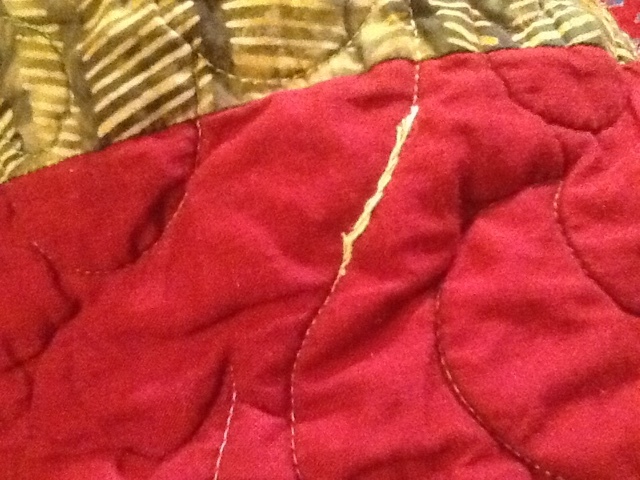 I used matching embroidery floss and stitched it a bit like a crazy quilt, so that it was clear what I was doing. 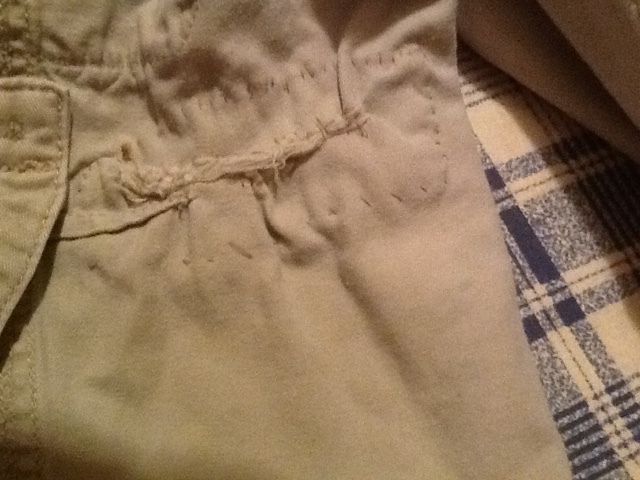 I knew I couldn't make the repair invisibly, so instead, I fixed it like I meant it--in the tradition of meaningful mending that makes beloved textiles last a long time. By contrast, I've developed a "two time and you're out" method when it comes to kids' pants. I started by using cloth wipes left over from our cloth diapering days. 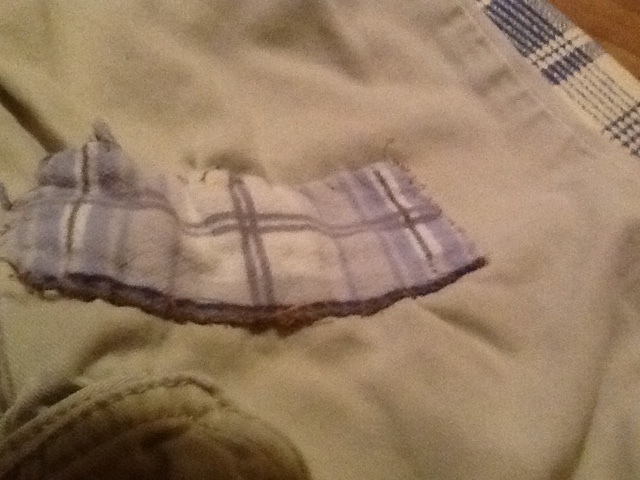 These are clean bits of well-used fabric, I hemmed and stitched them across knees as necessary. Here is the backside of the pair of pants...as you can see, the stitching is not fancy. The thing that I focus on when it comes to Slow Fashion (or how educational institutions work) is this: What are one's priorities? What is most important here? Do we need to waste time or money unnecessarily? How can we put people's needs first? Can we optimize conditions to re-use, recycle, or learn to make good use of new material to meet the needs of both people and the environment? Those needs can be basic (food, water, housing) or a little more advanced (higher education tuition, registration, etc.) but it all comes to how we prioritize. We need to use our ethical and moral values in the mix. Let's not throw things out unnecessarily- but people's needs (and the environment) come first in the equation to maximize long usage of things into the future. At least, that's how I hope it works in my house. What do you hope for? Maybe two? years ago, I made this sweater. 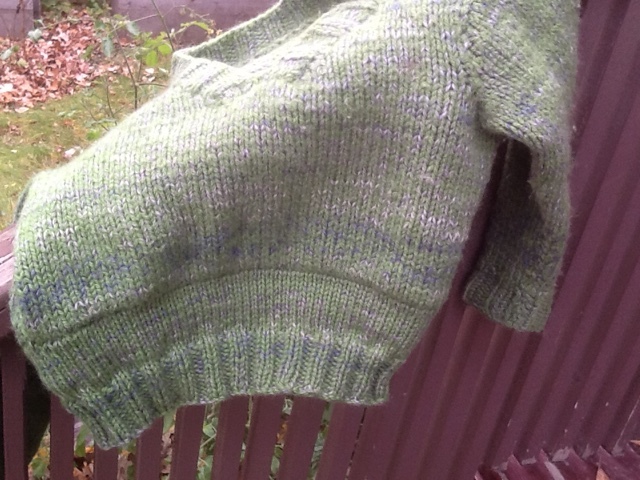 I can't seem to find a record of it on the blog, but I combined two relatively inexpensive wool/wool blend yarns (Patons Classic Wool/Merino Worsted and Patons Kroy Sock yarn) and made this sweater. It has never fit either twin perfectly, it's been too long in the sleeves or the body or both...but it has been worn a lot and well-loved. This morning, it was just above freezing and definitely a sweater moment. Sadly, it is now too short in the torso...but in the make do and mend way/the Slow Fashion October way...there is hope. Someone recently asked how I make these, and here's a snippet of my response. These days, they prefer henleys to v-necks, and will take a regular pullover with a round neck if it is offered. They do like cardigans but are still struggling to do zippers or buttons on their own, so I prefer pullovers as they save time and promote independence. Anyhow, the smaller chested twin is still definitely the right size for this sweater in the arms and chest. However, it is maybe 3-4 inches shorter than we would like it to be. I will cut off the ribbing, pick up the stitches at the bottom of the sweater, right above the ribbing, and knit down a couple of inches in stockinette, and then add more ribbing. The sweater is worn and the yarn looks new--people may be able to tell it is an addition. So what? 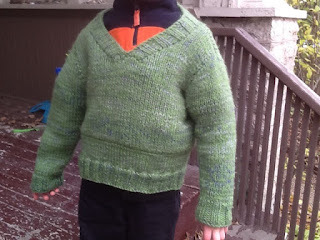 My child will be wearing a warm, handmade, wool sweater this winter. Again. 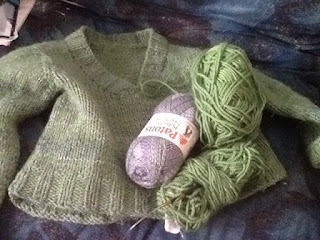 I am in the planning stages for two new sweaters. Every winter, I try to make two new sweaters, one for each twin. Each kid gets to choose his own colors and styles--within reason--and I'm just about to cast on for the first one. Sometimes the sweaters get rotated among twins, and whatever I planned ends up on the other kid. It's all good. In the meanwhile, this is a quick fix that reuses and values my work. I'm all in favor, and my kid is thrilled he will wear this beloved sweater for one more season. This is, at essence, what it means to me to embrace a more sustainable wardrobe...it takes time, but it saves time and money, too. It's worth it. 1) I had a blast teaching at the Manitoba Fibre Festival. I'm really worn out though. The spinning class was inspired, in part, by a really out of control stash...since having kids, I just don't spin as much. I loved sharing 10 small packets of non-wool fibers and information with my students, and maybe sending them home with these .5 oz-1.5 oz packets of flax, ramie, silk, cotton, llama, alpaca...etc. will enable them to try something new. It also helped me to share something I'd somehow managed to amass too much of and redistribute it to good homes. 2) I also have re-issued an old favorite. 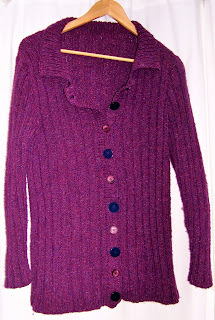 I re-visioned the Plum Ribbed Cardigan in Berroco Remix, a yarn that uses all recycled fibers. 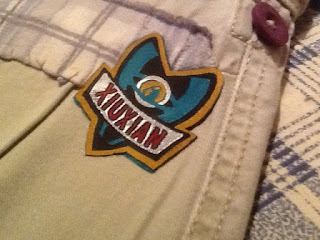 I originally designed it for Knit Picks in 2006. Eventually, copyright returned to me and I always intended to reknit it for myself but never got to it. 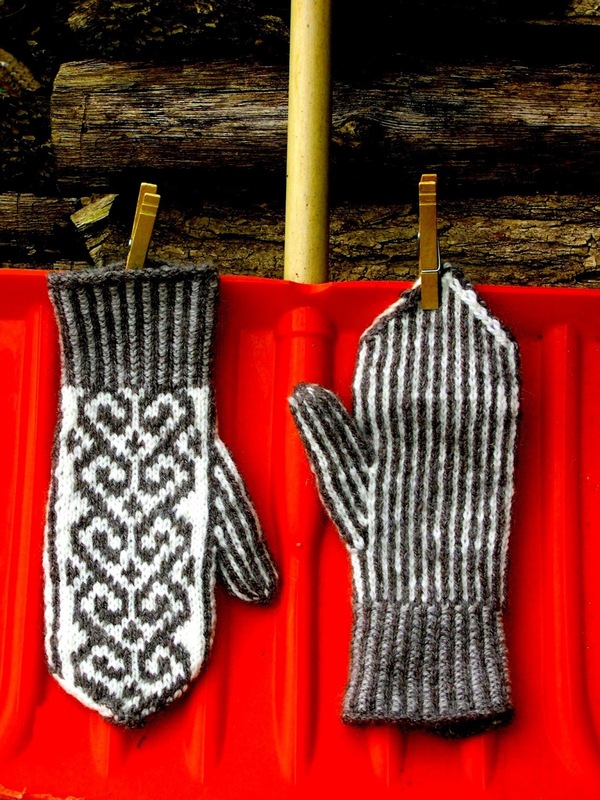 This week, I released it on Ravelry in a new format. It includes new photos, metric measurements, and yarn suggestions. It's also available for only $5US as an introductory (retro) price. Please check it out! 3) Here's my most recent piece on the CBC. It's about international moving costs and the recent Canadian Liberal government aides who moved from Toronto to Ottawa. They racked up enormous moving costs...roughly $126-189 per kilometer, paid by taxpayers. Our stipend from the university? $3.95 a kilometer. We were happy to move so that the professor could do research and teach in Canada, but why is it that some people get gold-plated moves instead?! This seems tangential to slow fashion, but it's not. Making economical and careful use of one's resources is important. When I work with other people's yarn or expect to bill someone else for my services, I try to be reasonable because I don't want to promote waste or excess of any kind. We need supplies and income, but not enough to insulate our houses! This too (unnecessary stash, or out of control waste of yarn or charging too much) is a form of unnecessary waste. It's a lot of money! Taxpayers could use it on groceries or ....sweaters... instead. Note: "Plum Ribbed" is FULL of ribbing, (the knitting pattern) and that is why it is named this. Please feel free to knit it in any color you like!